I’ve been spending a lot more time outside the apartment lately. I feel restless and impatient to see and hear and learn as much as I can. But I can only walk around the town for so long until I have to sit down and actually do something productive like write a poem or read a book. There are hundreds of little restaurants I could stop at, but sometimes I don’t want to eat, I just want to sit back and watch the traffic and listen to the car horns and watch the people wearing their medical masks and drifting by on their bikes. Sometimes what I really need is a nice quiet cafe and a cup of coffee. I never thought I’d find a real American style cafe in this little Chinese town. Not a “real” American cafe, complete with the sound of a coffee grinder, the smell of steamed milk, wireless internet, sandwiches and pastries. Surely not in podunk Pizhou, where chicken sandwiches are mistaken for hamburgers, and traffic lights are less than suggestions. I’m happy to report I was wrong. Fuwa Bakery is less than a ten-minute walk from my apartment, and it has almost everything an American cafe would have: espresso, wireless internet (although I may be mooching off the hotel next door), and even a rough and very Chinese version of a sandwich. 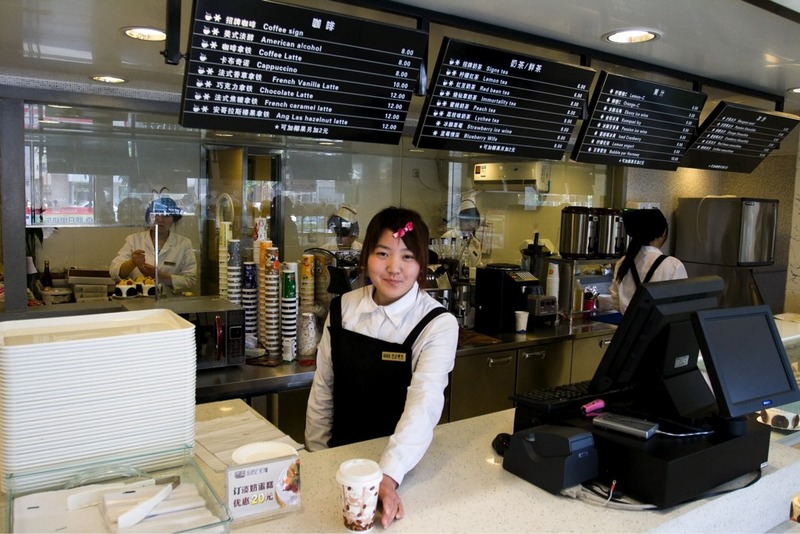 Even better, the baristas are willing to help me with my Chinese as long as I help them with their English. It even looks like it’s American. They aren’t wearing coats…but maybe it’s warmer. But it looks pretty nice. What a find! I really love your photojournalism. This picture is a perfect compliment to the post. I’m honored that you would comment on my blog. I looked at your photography and I’m really impressed at your eye for composition. I’ve never been very good at photographing trees. Thank you! I’m very much an amateur. I do okay with landscape and nature stuff, but not so well at people and the kind of photojournalism that you are doing here, which is what I really love. I enjoy your stories as much as your photos. When I was fresh out of undergraduate school I wanted to teach overseas. I applied to the DoD schools, but you need 2 years experience for that. So I went to Texas instead – which is practically another country. 🙂 And there I met my husband… and never made it to an overseas school. So in a way, I guess, I’m imagining what it would have been like by reading your blog.